Sign up here to receive publication announcements. "The Responsibility Process offers powerful coaching. Christopher doesn’t just define the problem and then leave you with it the way some books do. He provides abundant tools, practices, and wisdom for taking ownership, solving problems, and developing your consciousness as a leader. I know you will enjoy this book and live a better life for having read it." Order now from Amazon.com (USA), Amazon.ca (Canada), Amazon.de (Germany), Amazon.fr (France), Amazon.co.uk (UK), Amazon.es (Spain), or Amazon.it (Italy). Kindle and iTunes/iBook versions too! Contact us for a volume discount starting at 20% on ten or more books. Tell us (1) how many books you want, (2) what country they are being shipped to, and (3) when you need them. "This is an important book. The discovery and development of The Responsibility Process is a contribution to the psychology of success and happiness." "This book changed how I talk about responsibility in my training courses and with my teen daughters. An ownership mindset is critical to business agility. Avery brilliantly dissects how ownership (or the lack of it) works in the mind and what to do about it to lead yourself and others to freedom, happiness, and results that matter." "Over the last ten years I've seen time and time again how Christopher's work has created remarkable transformations in individuals, leaders, and entire companies. I've wanted a powerful next step to give people after I introduce how that transformation is possible. I'm thrilled that I can now recommend this outstanding book as a next step to unlock that potential." "Traditional management was about accountability. Modern leadership is about responsibility. In his new book, The Responsibility Process, Christopher shows you how to take responsibility in all aspects of your life. His previous book—Teamwork Is an Individual Skill—was one of my favorites to recommend. This one will be my favorite book gift for years to come." "I have long been a fan of The Responsibility Process. I am really happy to see this book so we can study Christopher’s approach. I'm a believer in the power of small steps—taking action to make change. This wonderful guidebook will instruct that process—not just for your organization but also in your own life." "Do you want the best possible life you can live? Read and integrate The Responsibility Process into your life. You will receive benefits beyond your imagining." "I met Christopher and was introduced to The Responsibility Process in 2006. We hired Christopher to help build our manager training program, and it was a great investment in our culture and true foundation for our rapid growth based on shared leadership. The Responsibility Process is a journey to mastery, and the mental models help me catch myself. I love the formal process of taking 100% responsibility for myself and in the formation of teams, including leadership teams. The Responsibility Process packages Christopher's teachings in a very effective way for adoption by you or through your organization. I would recommend chapters 3–7 as a monthly book study for your team. I especially appreciated his new Catch Sooner Game and focus work required for adding clarity to intention. The language is powerful and key to wide-scale adoption with teams. I have used the Three Keys to Responsibility (chapter 4) as a structure for many talks I have given. This chapter is pure gold and anchors the book, the value, and the potential for you and beyond. This book represents a set of tools and structure that with a healthy mindfulness practice creates insight, integration, and empathy for others. For me this is part of lifelong practice in creating happiness, effectiveness, loving relationships, and impact. I look forward to a hard copy that I can keep close and that will replace my notes from his courses." "The Responsibility Process is central to Catalysts' approach to leadership. It has played a significant role in Catalysts being the most popular employer in Austria 2014–2016 and the number-one IT innovator in Upper Austria. I'm excited to have this book to share with everyone interested in understanding our culture." "A game changer! This book is my go-to when I find myself feeling as though life is controlling me instead of me controlling my life. Thank you Christopher for helping so many of us find the way to live based on our personal freedom, power, and choice." "Wow! The Responsibility Process is a fabulous book. I’ve put so many insights into practice already. From the first pages, it pulled me in and was immediately applicable to my personal mastery and in my role as a leader of leaders. The five-step culture-building bridge from responsibility to accountability in chapter 9 is brilliant. It helped me diagnose organizational hotspots and see where I missed my leadership responsibility for one or more steps on the bridge. As a result, I’ve had more effective conversations with several of my staff. I anticipate better results for them and the organization." "Read this foundational, life-changing book! I leverage The Responsibility Process daily to process my reaction to events and to create consistently constructive action plans." "I highly recommend this book. I've been using The Responsibility Process for over a decade with meaningful results. In business, it provides a shared language for rapidly moving past finger-pointing and excuses toward problem resolution." 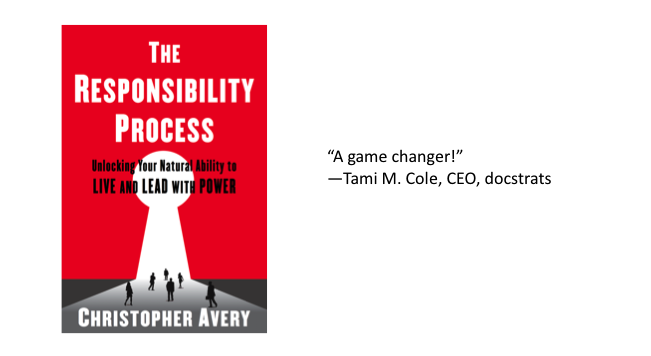 "The Responsibility Process is a must read for anyone who seeks to unlock their ability to truly live and lead with power. Dr. Avery offers a simple and instructive guide that can easily be applied across cultures, languages, and environments. In leading a multicultural organization, I have worked to encourage teamwork, collaboration, and personal accountability as behaviors and values that support the development of our company and our service to customers. The Responsibility Process perfectly sums up what we strive to do and provides clarity and a purposeful path toward an outcome that will serve us personally and as an organization. The Responsibility Process truly is a gift and something important and worthwhile to share with others." "After experiencing just how transformative The Responsibility Process was to my own leadership practice, I am delighted that this book is now available. Thank you Christopher for bringing the message to an even broader audience. The lessons and tools are practical and can be applied by business leaders at any level from CEO to summer intern." This book is a refreshing view on how to better manage your business, your relationships and your life. Christopher has taken a complex, life long study and distilled into a straightforward presentation of a not so simple topic - Responsibility. You will find this book impactful and if you really focus and apply the material it will likely change your life forever.